LOFAR isn't the only radio telescope under construction in Europe at the moment. At curiously similar timing, the SRT (the 64m Sardinia Radio Telescope) is also in the midst of being built (in Sardinia, Italy). Images and videos are available here. 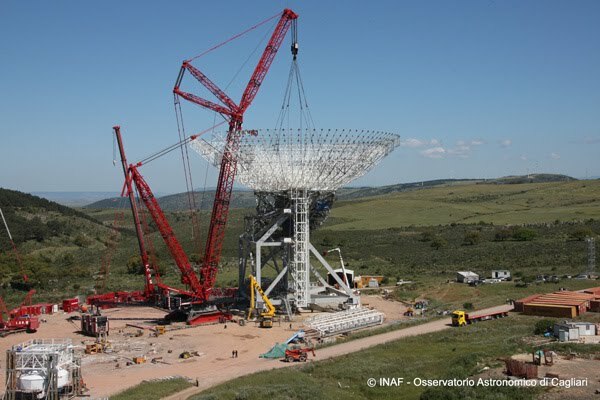 Of particular interest, the video from 22-May-2010 is a 36-hour time-lapse video of the lifting of the dish structure. As you can see, the SRT is a single dish radio telescope, while LOFAR of course is an array telescope. While both are radio telescopes, LOFAR is also designed to observe at MUCH lower frequencies than the SRT. Here is a picture of the SRT taken from the INAF website.